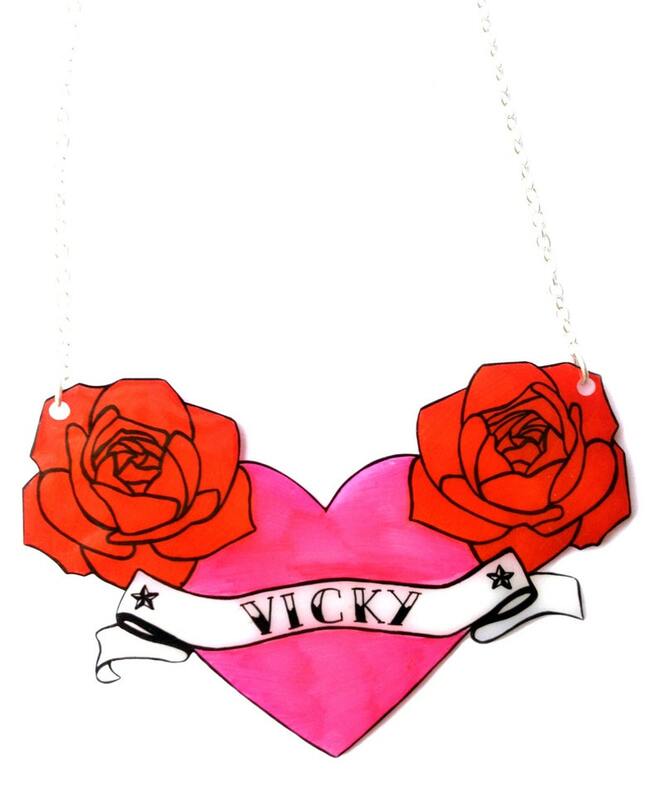 Show your love for a 'certain someone' with this heart and rose necklace. A pretty pink heart bears a white banner with tiny nautical stars framing a name or word of your choice. Two classic red roses complete the piece. A perfect memory of a loved one - use the name of your beloved, your own name, or why not a nickname or favourite word? Hand drawn, coloured and cut. Let me know what word or name you would like, in the 'notes to seller' box at checkout, or message me. Approx 8.5cm wide, however as each piece is hand made and drawn just for you, sizes may vary very slightly. Your heart and roses will be suspended in the middle of a 16" trace chain, with a 2" extension chain. Silver plated and gold plated chain available - please choose your preference in the options. A gift that was very much appreciated. Thank you!! Je suis ravie de cette belle création! Je l'ai très bien reçue! I am delighted with this beautiful creation! I received it very well!